The spiritual FRUIT of praying the First Luminous Mystery is LIVING OUT THE VOWS OF SACRAMENTAL BAPTISM. "In those days John the Baptist appeared, preaching in the desert of Judea (and) saying, "Repent, for the kingdom of heaven is at hand!" It was of him that the prophet Isaiah had spoken when he said: "A voice of one crying out in the desert, 'Prepare the way of the Lord, make straight his paths.'" John wore clothing made of camel's hair and had a leather belt around his waist. His food was locusts and wild honey. At that time Jerusalem, all Judea, and the whole region around the Jordan were going out to him and were being baptized by him in the Jordan River as they acknowledged their sins. When he saw many of the Pharisees and Sadducees coming to his baptism, he said to them, "You brood of vipers! Who warned you to flee from the coming wrath? Produce good fruit as evidence of your repentance. And do not presume to say to yourselves, 'We have Abraham as our father.' For I tell you, God can raise up children to Abraham from these stones. Even now the ax lies at the root of the trees. Therefore every tree that does not bear good fruit will be cut down and thrown into the fire. I am baptizing you with water, for repentance, but the one who is coming after me is mightier than I. I am not worthy to carry his sandals. He will baptize you with the holy Spirit and fire. His winnowing fan is in his hand. He will clear his threshing floor and gather his wheat into his barn, but the chaff he will burn with unquenchable fire." Then Jesus came from Galilee to John at the Jordan to be baptized by him. John tried to prevent him, saying, "I need to be baptized by you, and yet you are coming to me?" Jesus said to him in reply, "Allow it now, for thus it is fitting for us to fulfill all righteousness." Then he allowed him. After Jesus was baptized, he came up from the water and behold, the heavens were opened (for him), and he saw the Spirit of God descending like a dove (and) coming upon him. And a voice came from the heavens, saying, "This is my beloved Son, with whom I am well pleased." 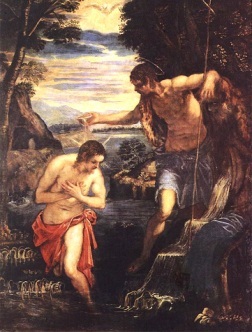 In the First Luminous Mystery, “Jesus' public life begins with His baptism by John in the Jordan. John preaches 'a baptism of repentance for the forgiveness of sins' (Luke 3:3)". The video below features a recitation of the first part of the Rosary, followed by the First Luminous Mystery, the Saviour's Baptism, then the recited decade of prayers. It is also accompanied by soft background music and scrolling scripture passages. To play the video below, click on it twice.